If you have a Mac running Snow Leopard (10.6) and have profiled the monitor but now your Apple Motion application will not show you the images properly and you only see black boxes you are experiencing an incompatibility issue with the profile's version. If you change the preferences to create v2 ICC profiles and then re-profile this will resolve the issue you are seeing. 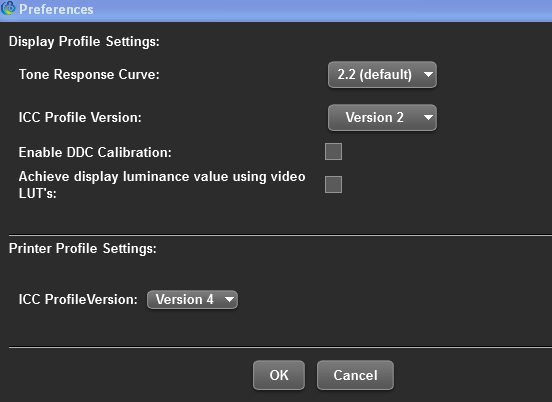 With version 1.1 the ColorMunki software began allowing users the ability to choose between either v2 or v4 ICC profiles. This can be very useful is you are using an application such as Windows Photo Gallery or Apple Motion that are not compatible yet with v4. To change these settings simply open the ColorMunki software. On a PC go to File > Preferences. On a Mac go to Colormunki Photo > Preferences. While you now have the ability to choose to make either v2 or v4 profiles you most likely you will never notice the difference between the two. The main changes are structural and the removal of ambiguities that were not needed in the format of these files to allow for better performance in v4. ColorMunki defaults to v4 ICC unless changed manually in these preferences.